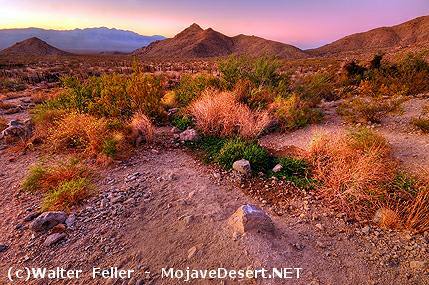 Located six miles northeast of Kelso, San Bernardino County, in the Mojave National Preserve. The post at Marl Springs in the Mojave Desert was first garrisoned by the Army as an outpost by troops from Camps Cady and Rock Spring on October 5. 1867 and was occupied continuously until May 22. 1868, at which time it was abandoned permanently. The number of troops stationed there was usually minuscule. The site apparently was never given official status by the Army except as an informal outpost of Camp Cady. Marl Springs, however, continued to be an important station on the travel route across the Mojave Desert also serving as the site for several trading posts. Many deserted structures and ruins now occupy the site. Crumbling rock walls mark the site of the old Army post that was erected by John Drum and his troops in 1867. It may have been the last of the desert redoubts to be established, but Camp Marl Springs' history indicates it was one of the most important. Location had a lot to do with the importance. It was about halfway between Camp Cady and the Colorado River. And, more so, it was flanked on the east by a 12-mile valley that had a 1,400 foot elevation change, a torturous trail of loose gravel and sand repeatedly crisscrossed by dry washes. To the west, it was even worse. Devil's Playground was the nickname pinned on a 17-mile stretch of drifting sand that had neither tracks to follow nor water to drink. Especially for the eastbound traveler, Marl Springs was a welcome sight. 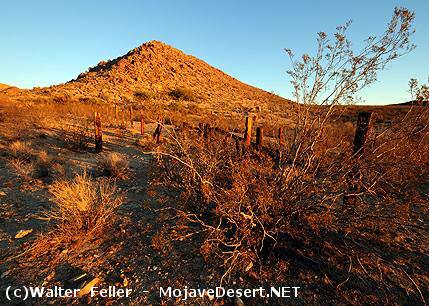 In 1852, John Brown later the ferry owner at Fort Mojave, found the springs a life saver. When his party had become exhausted in the blowing sand dunes of the playground,' Brown had struck out ahead for Marl Springs. The peaks of the Old Dad Mountains showed him the way out of the windswept bowl, then he marked his desperate route between the bare, rocky wastes of the Kelso Marl Mountains, on his right, and rolling lava hills on his left. He dropped into Marl Springs without ceremony and filled his belly. After the life had returned to his joints and veins, and a keg had been filled with water, he returned to the wagon train. His keg provided enough refreshment to get the travelers and their stock to Marl Springs and a new life. A couple of dozen Piutes met Brown at the spring both times, but "they behaved well." Marl Springs was not one of the original Carleton redoubts across the desert. The intention was that roving patrols between Rock Springs and Hancock Redoubt (at Soda Lake) would keep the area clear of roving Indians. The springs were an important water source on the road. The Whipple Survey party of 1854 spent a night at the site on March 7, reporting "excellent grass . . . scant wood . . windy . . . cold." They found the springs "small, not half enough water for the mules, but it constantly flowed and after a while there was enough to satisfy the mules." The flow was so regular that they were able to refill their kegs and also have enough for the camp's use. The water that drew the traveler also drew the opposition. Fifteen or 20 Piutes were reported harassing wagon trains on the western half of the road in 1863. "It is said that they killed one of the mules belonging to a citizen at Marl Springs," the Fort Mojave commander wrote to headquarters. A year later, rumors of Indian depredations again were heard. The Mojave commander received a letter from a civil officer "stating that four horses and a bullock had been killed and eaten by Indians at Marl Springs." But this was a false alarm; two days later the official reported that the stock had been found, neither killed nor eaten. With traffic on the road increasing, the Army put token protection at Marl Springs in order to provide some type of cover from attack. The tiny post sat at the foot of a spur of the granite Marl Mountains. Commanded on two sides by high had to sacrifice defensibility in order to command the spring. The facts of desert life were bluntly a matter of defending from a poor spot that had water instead of a good but dry location that could prove a trap. In 1867, the post was surrounded by hostile Indians. During a 24-hour siege, the station had a full test of its position. There were only three men there but they came out with their scalps intact. In the true spirit of the romanticized West, just at dawn a rescue column of soldiers cut through the besieging circle of Indians to save the post. Marl springs are located roughly between The Kingston and Ivanpah subsections. The Silurian Valley subsection has been included. This subsection is the alluvial plain of Ivanpah Valley. There are a few moderately steep hills protruding through the alluvial plain. This subsection includes mountains, hills, pediments, and high alluvial plains between Silurian Valley and Devil�s Playground on the west and southwest, California Valley on the northwest, Pahrump Valley on the north, Mesquite Valley and Ivanpah Fault on the northeast, and Ivanpah Valley on the southeast, plus the southern part of the Spring Mountains. This subsection includes the alluvial plain of the Silurian Valley, from where the Amargosa River enters it on the north to where the Mojave River enters it on the south, and the Devil�s Playground just southeast of Silurian Valley and up Kelso Wash toward Ivanpah Valley.